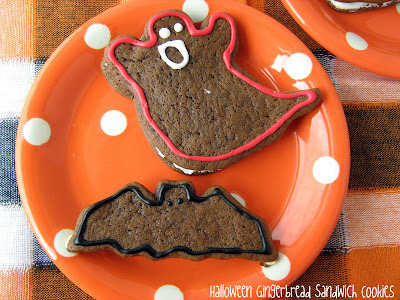 I saw this recipe in a magazine a year or 2 ago and thought it would be a really fun one for kids to try for Halloween. One saturday, I mixed up the dough and chilled it. This dough was very sticky and somewhat difficult to roll-out and cut with cookie cutters. I let my kids choose a couple of different shapes that they wanted to decorate and then I just rolled the rest of the cookie dough into balls, and baked them. The cookies were not too sweet. 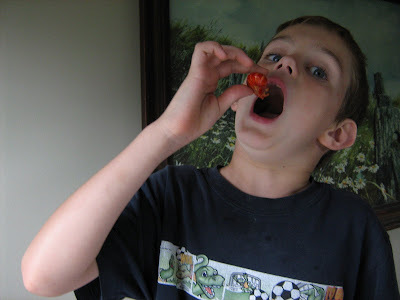 They had a nice flavor, which my kids really liked. 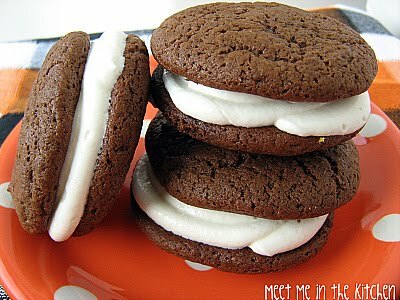 The frosting was just cream cheese and marshmallow fluff, so it wasn't overly sweet either. I used the leftover frosting on these pumpkin cupcakes and also to frost/drizzle on these pumpkin cinnamon rolls. These were a definite hit! My kids really liked them and we had fun decorating together. 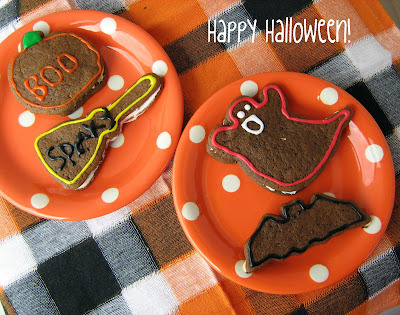 Have fun celebrating Halloween tonight! I am hoping the rain will let up for trick or treating later. I love pumpkin anything. 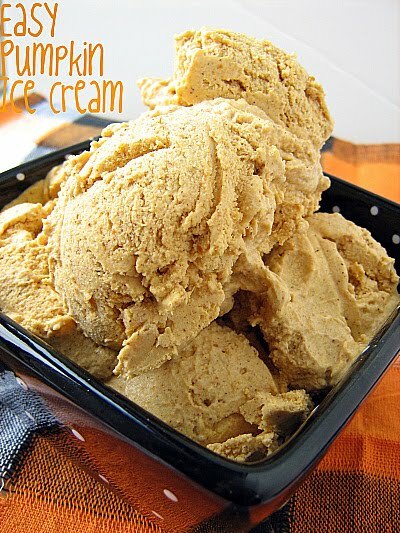 One of my favorite things is pumpkin ice cream. I saw a really easy, non-custard recipe for pumpkin ice cream on Simply Recipes and decided I wanted to make it. I bookmarked the recipe and when I was ready to make it, I went back to the link and it was gone! I remembered the recipe in my mind and decided to make it anyway. It was really easy- just 4 ingredients, that you mix up, chill and churn. I remember the recipe said it was best served the day it was churned. I let it set up in the freezer for a couple of hours and then let my kids try it. They really liked it-we sprinkled some chocolate chips on top. I tried a bite and thought it was a little bit too creamy (Wierd, but that's what I thought). I think it would taste better as a layer to a chilled pie maybe, with a gingersnap crust. We enjoyed it and it was fun to make! Combine all ingredients in food processor until smooth. Chill mixture until cold and transfer to ice cream maker. Churn according to ice cream maker directions. Freeze for a few hours until firm. This ice cream is best enjoyed the day it is made. 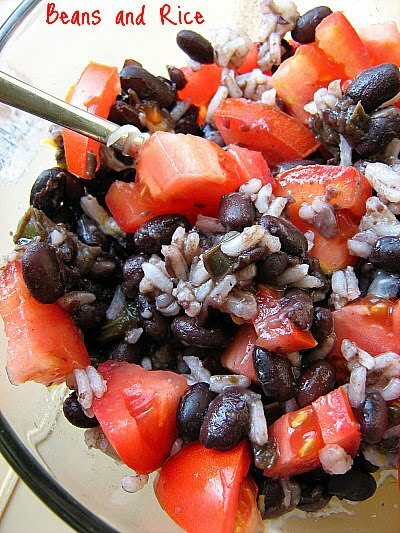 My sister sent me this recipe for Black Beans and said that they were the best ones that she had ever tasted. I believed her and decided I would have to make them. I usually use canned beans when I cook, draining and rinsing them, but this called for dried beans, which you have to soak overnight. I actually started this recipe in the morning and soaked my beans for 8 hours. It worked! I didn't really know what to expect from this recipe, but it was worth the time. The taste was amazing. 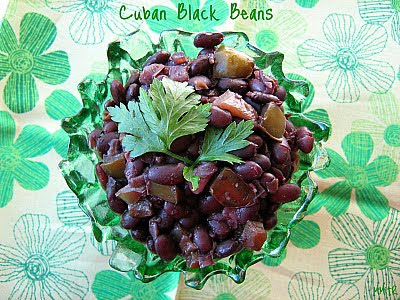 These beans are so flavorful, which really surprised me and by the time they were done cooking, the texture of the beans was perfect-not hard or crumbly. I ate a big bowl of these plain and then added some cooked rice and chopped tomato when we ate them again. These would make a great addition to a burrito or a nice side dish. Very, very tasty. Thanks Audrey, for passing the recipe on to me! On a little side note, has anyone seen these cute little mini pitas? When we went to visit my sister (same one who gave me the BB recipe) this summer, she was making all sorts of cute things with these mini pitas. I found them at Publix and now, we eat them all the time. 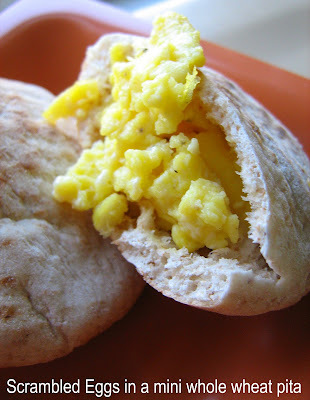 I stuff them with lunchmeat, cheese and a spinach leaf and pack them in my son's lunch for school, we dip them in hummus, make pb&j sammies with them, and also make little breakfast bites, here I just filled them with scrambled eggs. 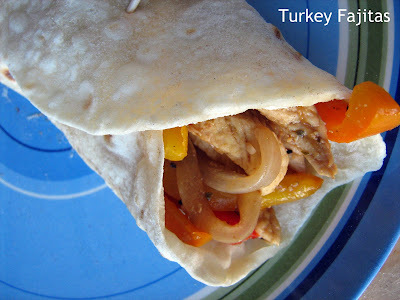 I buy the whole wheat mini pitas and they are really fun to fill with different things. If you can find them, try them out! Rinse Beans. Combine beans, water, chopped pepper. Soak overnite. Cook covered for 45 minutes or until soft. In a frying pan, saute onion, garlic, 2/3 cup olive oil, and minced pepper. Take 1 cup of beans and mash into sauteed vegetables. Pour sauteed veggies into bean pot. Add 4 tsp salt, 1/2 tsp pepper, oregano, bay leaf broken in half, and sugar. Add 2 tbsp vinegar and wine. Cook 1 hour uncovered to thicken. When ready to serve add 2 Tbsp oil. 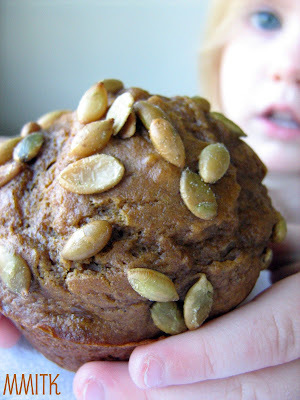 I wasn't expecting much from this week's CEiMB recipe, Pumpkin Pie Muffins, which was chosen by OddBall Oven Mitt. You can find the recipe by clicking on the link at the bottom of this post. 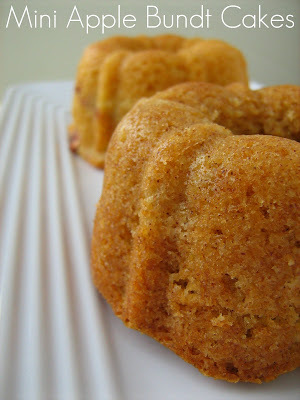 I was pleasantly surprised by these muffins- they were much better than I thought they would be. I have made lots of muffins and sometimes making them healthy, means that they turn out with wierd texture or something else. Not these. They were really delicious. 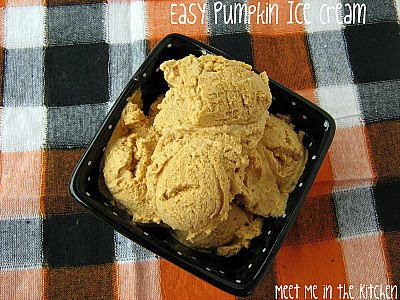 The combination of pumpkin puree, molasses, and lowfat buttermilk, makes a really yummy treat. I made 1/2 batch and sprinkled mine with roasted, salted pepitas. I also added a little bit more spice than the recipe suggested. I was really surprised by how high these muffins became in the oven. The tallest muffins I have ever made by far. My kids, my mom, and I really liked these. I should have made a full batch. 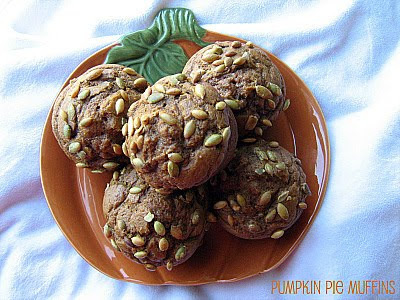 If you want a fall-ish, pumpkin-y treat that you can feel good about eating- these are the ones! Check out the CEiMB Blogroll to see what everyone else thought about these muffins! I am taking my mom to the airport today. It has been a really fun week. 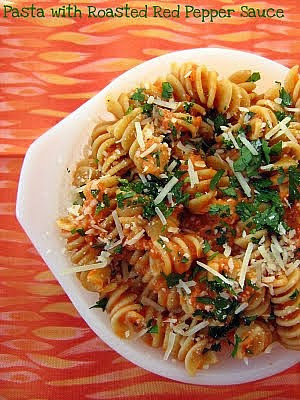 I am easily influenced by other peoples blogs, pictures, and suggestions when it comes to trying different recipes. A couple weeks ago, Tracey sent out a tweet about this pasta from The Pioneer Woman, so I went to her blog to look at the recipe. Her gorgeous photos and the fact that this pasta had to do with roasted red peppers, which I love, helped me decide to make this for dinner that night. I had everything on hand, so it really didn't take long at all. 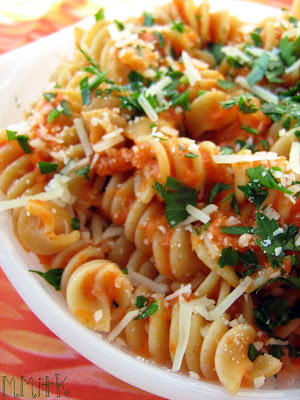 I used whole wheat pasta because that is what I always use. I roasted my peppers in the oven, since I don't have a gas stovetop. I also omitted most of the heavy cream at the end and just splashed in a couple Tbls of half and half instead. 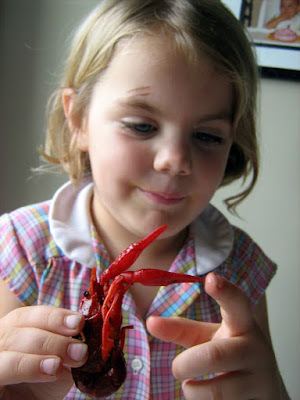 So, have you visited The Food Librarian's blog lately? If you have then you know exactly what is going on over there. If you haven't, you are really missing out! Mary is doing something called I like Big Bundts: 30 Days of Bundt Cakes, meaning that for the 30 days leading up to National Bundt Day, November 15th, she is spotlighting 30 different bundt cakes. 30 Days=30 Bundt Cakes. 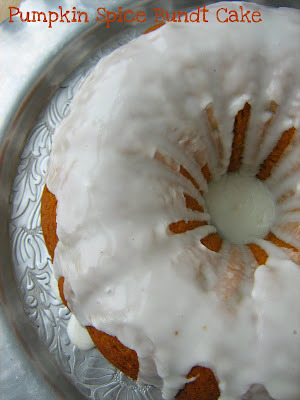 I went over to take a look at Day #1's Bundt and it just happened to be this beautiful Pumpkin Spice Bundt Cake with Buttermilk Icing. 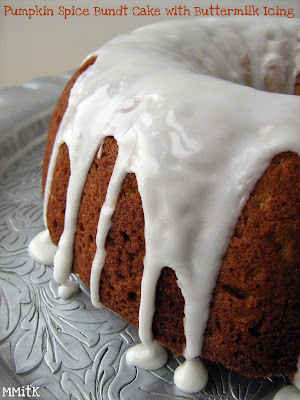 This bundt cake was calling my name. I didn't have anywhere to take it. I didn't necessarily have anyone to share it with, but I couldn't resist whipping it up, right then and there. The day was perfect for it- rainy, cloudy and cold. No one wanted to leave the house. The oven warmed us up and the smell brought happiness to the house. It smelled amazing. It was super moist. I upped the spices just a little bit. The little drizzle of icing was perfect. This might just be one of my favorite cakes-EVER! I didn't want to share. I cut everyone a small slice and then I wrapped it up tightly in plastic wrap and put it in a plastic container so that we wouldn't eat the whole thing in one day. I can usually just have a taste of something I bake and that is good enough. I send it away for someone else to enjoy. I ate only salad for lunch and dinner on the day I made this, so I could justify having another slice after dinner. Are you convinced yet? 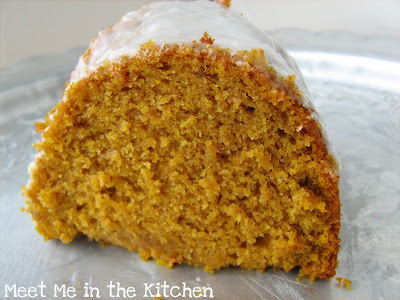 If you like pumpkin anything, make this cake! Maria made a version with chocolate chips and everyone who tried it loved it too! 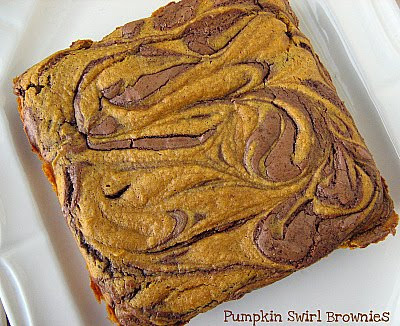 Yes, you read that right- Pumpkin Swirl Brownies. Also known as, one-of-the-best-things-that-has-ever-happened-to-a-brownie. In my humble opinion, of course. 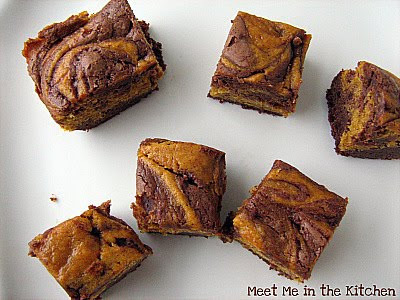 Esi sent out a tweet about her post which featured these brownies. 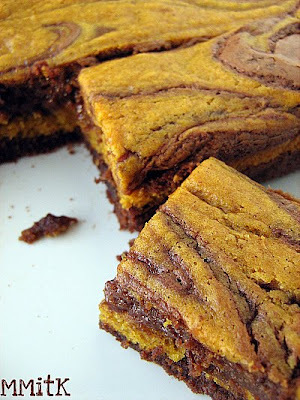 I went and looked at the post and decided almost immediately that I was going to make these. I try not to let that happen too much. I try to plan what I am going to bake ahead of time, but every once in awhile something like this jumps out and says "Bake Me NOW!" You mix up a batter and divide it in half. Melted butter/chocolate gets mixed into one half. Pumpkin, a little oil and spices get mixed into the other half. Then those 2 batters are layered and swirled. 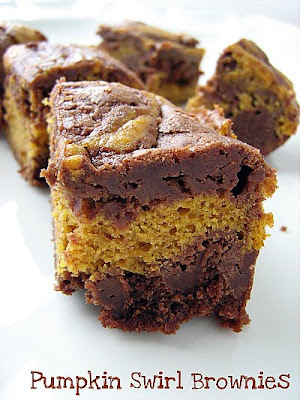 So it is kinda like a cake-y brownie (I like those better) and a moist, pumpkin cake mixed together. Not kinda like, that is what it is. I underbaked these just a tad, because I didn't want either part to be dry. 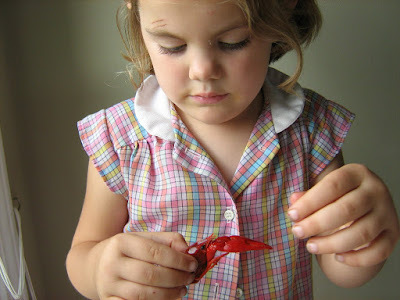 Then I refrigerated them overnight and took them to playgroup in the morning. *note- the recipe calls for cayenne pepper- I left this out, even though it was a small amount because I was going to be taking them to playgroup. I want to try them again with the cayenne. This is my little Ry-Bear. Today she turns 5 years old. She is the one who has been begging me to buy crawfish everytime we go to the grocery store. She was so happy. A few of them still had claws and everything! Now, being the non-Southerner that I am, I had absolutely no idea what to do with these little guys- heads and all. That is where Margaret stepped in to help. I left a comment on her blog, Tea and Scones, when she posted a shrimp recipe and she got back to me about some different ways that I could cook these guys. Luckily, my kids are pretty fearless. They did all the head removing for me. I was going to post a picture of them in action, but it made me sick to my stomach. I am a weakling! 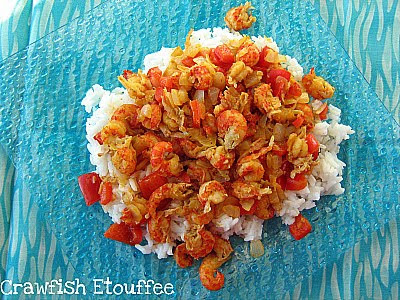 Anyway, I decided to make the Crawfish Etouffee. It is really quite simple. You melt some butter- I used 2 Tbls, add chopped onion and red bell pepper, season it up (I used Creole seasoning), add the crawfish and let it cook for a few minutes. Then you serve it over rice. I can't even tell you how much my kids loved this. They had heaping plates full and then, had 2nds. They told me they want to try scallops and clams next. Now if the birthday girl could just figure out what kind of b-day cake she wants. First it was princesses, but now she wants green frosting that tastes like pink, so she can cover it with dinosaurs and jungle animals. (She is a good combo of girly-girl and tomboy.) Should turn out interesting. Life always is with our little Bear! On a Saturday night, while my hubby was watching football, I needed to throw a meal together. I had been planning to make fajitas, but didn't realize we were out of tortillas. I decided to make some from scratch. I remember making them when I was growing up with oil, flour, salt and water. I just couldn't remember the exact porportions. I had some turkey breast fillets in the fridge, so I threw together the fajita marinade I usually use and let the meat marinate for awhile. Not as long as it should have, but I didn't have a ton of time. I sliced up an onion and some bell peppers and made the tortilla dough. While the dough was resting, I cooked up my turkey/onion/pepper mixture and then covered that, to keep it warm, while I made the tortillas. My kids loved the tortillas. I thought they were pretty good, but next time I will probably use melted butter or olive oil for a little bit more flavor. mix together flour and salt. Stir in oil. Add water bit by bit, stirring until dough forms. Knead until smooth. Divide dough in half, then in half again, and one more time, so that you have 8 dough balls. Cover the dough and let it rest. 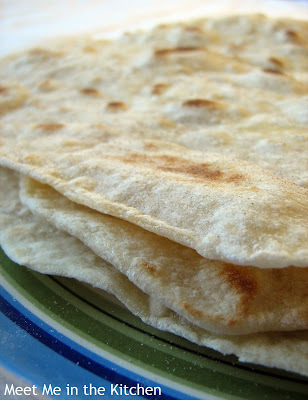 When ready to make tortillas, sprinkle a little flour on a clean surface. Roll out dough as thinly as you can. Warm a saute pan over medium heat. Place a tortilla in the hot pan and when bubble form, turn it over to the other side. It only takes about 1-2 minutes per side, or less. Continue with other dough balls until all tortillas are formed. 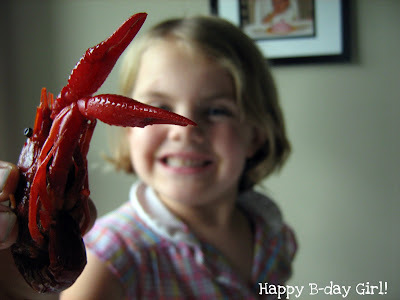 I found out about this recipe when Kalyn sent out a tweet about a new post on her blog. 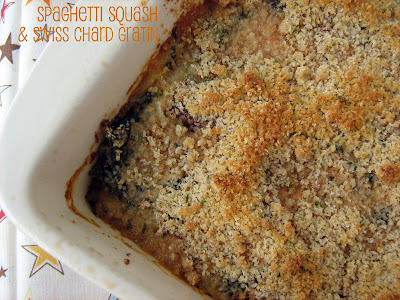 I immediately went over to her blog to check out the Spaghetti Squash and Chard Gratin. I love spaghetti squash (although this love is fairly recent) and I also love swiss chard. I never in a million years would have thought to put the two together. I put this down on my menu calendar and the next time I went for groceries, I found beautiful swiss chard and a nice sized spaghetti squash. This recipe takes a little time, but it is completely worth it. Plus, you can roast your spaghetti squash during the day, when you are at home, before dinner time. There are a few things that I did differently. I always roast my spaghetti squash whole. I preheat the oven to 400 degrees, poke my squash all over with a fork or skewer, cover a baking sheet with foil and pop the squash in the oven. I usually let it roast for an hour, turning it once or twice. This to me, is way easier than trying to cut through it raw. Once it has roasted, you can slice the thing in half with no problem. I also sauteed my swiss chard mixture a little too long. It wasn't completely my fault though. Some kind of emergency came up with one of my kids in the bathroom and so, you know how that goes. I also used chard with red stems and chopped them up and saute them too. I used greek yogurt instead of sour cream. 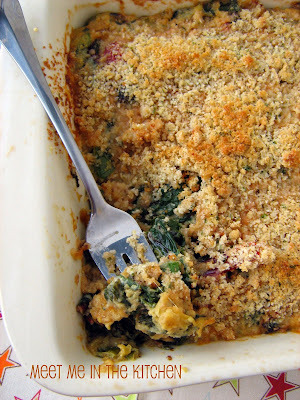 I topped my gratin with a combination of Italian seasoned breadcrumbs, grated Parmesan cheese and a little bit of canola oil- to bring the topping together. Delicious! I tasted it straight out of the pan and it was so good. My kids liked it and so did my hubby. So nutritious too. Check out Kayln's blog for great pics of this recipe and lots of other great recipes too. I picked my mom up at the airport yesterday and we are so excited that she is going to stay with us for a whole week! It has been fun already and having an extra pair of hands all day is wonderful! I have to apologize about my lack of commenting on other blogs while she is here. Last thing I want to do is sit at the computer when there are so many fun things to do. I will get to all of you, as soon as I can. 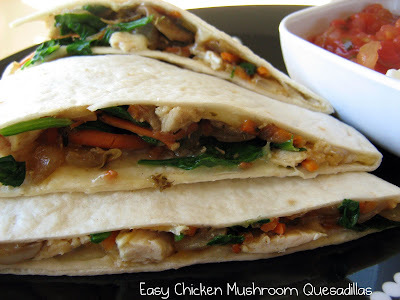 This weeks Craving Ellie in My Belly recipe, Easy Chicken Mushroom Quesadillas, was chosen by Marthe over at Culinary Delights. You can find the recipe on her blog or by clicking on the link at the bottom of this post. 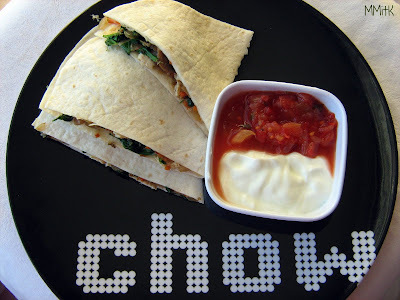 These quesadillas were very easy to throw together. Good thing, since easy is in the recipe title. You saute onion and mushrooms, add garlic, chicken, oregano, cumin, chili powder and spinach. I already had some cooked chicken in the fridge, so I just shredded that and used it. I also added matchstick carrots, since they were in the fridge. After the filling was cooked and warm, I melted the cheese and finished off our quesadillas in the microwave. That is how make quesadillas for my kids most of the time. 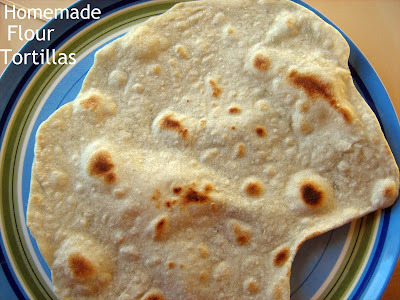 My husband requires that his quesadillas be cooked in butter, so they are nice and golden on the outside (since he is an adult, he can get away with unhealthy demands sometimes) and he doesn't like whole wheat anything, so we used normal flour tortillas. We dipped ours in the best jarred salsa out there- Herdez, it is the only jarred salsa I like. We used greek yogurt instead of sour cream. We liked these. A nice way to get some vegetables into something that usually is just full of cheese and chicken. Plus, there were enough other things inside of these that I wasn't too bothered by the mushrooms. Go see what the other Ellie's thought by checking out the CEiMB Blogroll! A couple of weeks ago, I had the urge to make an Apple Cake. Everyone was talking about Autumn, how the leaves were turning and the temperatures were dropping and apple cake just seemed appropriate. 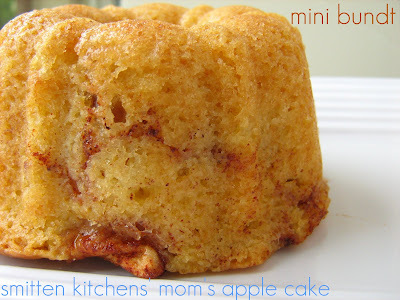 I had an idea of what kind of apple cake I wanted to make. I found a recipe on smitten kitchen that I really wanted to try and I also found another recipe that I remembered tearing out of a magazine years ago. After looking at the 2 recipes, I realized that they were almost identical, but slightly different. I decided to make 1/2 recipe of both cakes and compare them. This also meant I got to use my cute mini bundt and mini tube pans. 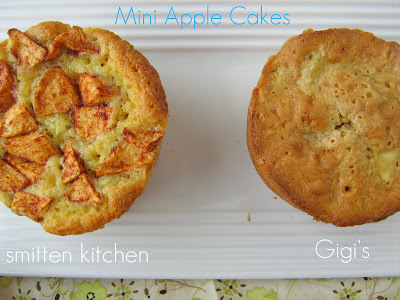 Gigi's uses granny smith apples that are thinly sliced and mixed into the batter. Cinnamon is also mixed into the batter and it is mixed with a hand mixer. SK uses macintosh apples, cut in cubes and only the apples are tossed in cinnamon. The batter is layered with the apples, not mixed. This cake has more baking powder and salt and a tad more flour. It does not use a mixer. The SK batter was thicker, looked more like cake batter, and most of the mini's were done at 30 minutes, although I started checking 5 minutes before that. Gigi's cake batter was thinner, almost like a quick bread or muffin. I reduced the sugar in both cakes. SK by about 1/3 cup and Gigi by 1/4 cup. 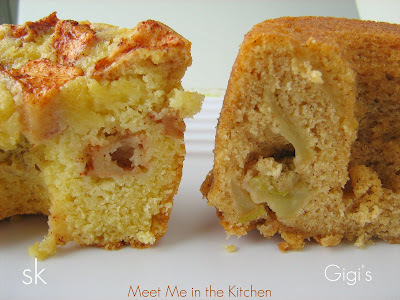 The definite favorite with most people was smitten kitchen's apple cake. I took these little cakes to my husband's work and both of the cakes were devoured, so both were good. My son preferred Gigi's, for some reason. He couldn't really put into words why though. This was a fun little autumn experiment. The Cake Slice is starting off another year with a new book to bake from. We are going to be baking from Southern Cakes by Nancie McDermott. 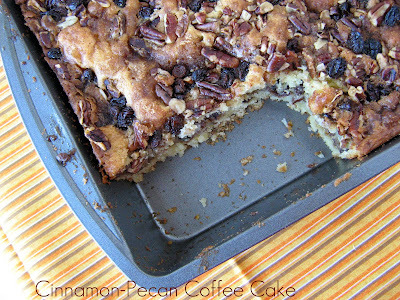 The first cake we baked is the Cinnamon-Pecan Coffee Cake. 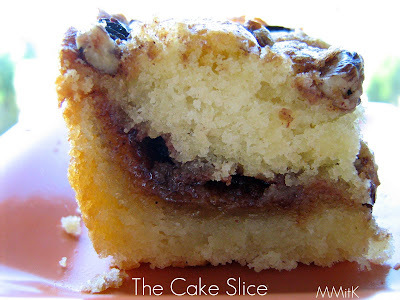 A very basic cake is layered with a cinnamon-brown sugar mixture, melted butter and a combination of raisins & pecans. This recipe calls for a 9x13-inch pan to be used, but I knew that would be way to much coffee cake for us, so I halved the recipe and made it in a 8x8-inch pan with great results. I reduced the baking time by about 10 minutes. This coffee cake took minutes to put together. The cake batter was easy and the fillings were easy too. I thought it was an interesting technique to spread the cinnamon-sugar over the batter and then pour melted butter on top of the cinnamon-sugar. I haven't ever made a streusel-y type topping or filling that way. The pecans and raisins are sprinkled on top of the melted butter. I had leftover melted butter. I thought the recipe called for a little bit too much, so I didn't use all of it. As soon as this came out of the oven, I promptly cut it into pieces and distributed it to plates to give away. I tasted one bite and it tasted exactly like a cinnamon roll to me. That was a little wierd because it didn't have the same texture as a cinnamon roll, but the taste was the same. To see what the other Cake Slice Bakers thought of this coffee cake, check out the Blogroll and come back next month to see another Southern Cake! Use a large spoon or spatula to add about a third of the flour mixture to the butter mixture and stir only until the flour disappears. Add a third of the milk and mix in. Repeat twice more until all the flour and milk mixtures have been incorporated. Stir just enough to keep the batter smooth.